Just like in real life, a good technical needs of top players to put together a winning team. So don’t be afraid to spend money on one-off contracts because there are lots of athletes who are synonymous with cost-effective. Use the tool "Advanced Search", located in the "Trading" tab to seek superstars’ specific times. In the search option, you can filter players by position, nationality, age, market value and, of course, by their clubs. Remember that there are few players in the team to expedite the transfer negotiations. Therefore, check time of contract of the athlete and, particularly, the development progress. A player signal to the status on the wane, for example, can be hired more easily because the club will, in fact, interest in trading him. On the other hand, if the progress of development point out that he is at the peak, hardly the club will relinquish him by values more into account. Loans make up the time "good and cheap"
Remember that loans can also be good option to structure competitive squads that don’t let the wage budget in the negative. Young players on loans have few opportunities in European clubs can act as "good and cheap". Always keep an eye on the salary budget, which can be found in the "View salary budget" tab in "My Team Info". After all, they are paid on the first business day of the month and it's always good to keep a positive balance to make payments on time and keep money saved for possible emergency hires. During the negotiation process, never accept the first proposal club dealer. Make counterproposals reducing the player's salary, contract time and the transfer value. Is always an eye on the percentage of successful negotiation, as each new offering can significantly reduce the chance of success of the transaction involving the athlete. The player list of junior staff can be accessed on the "Team Management". If you want to promote a promising playmaker in development, start the negotiation pressing the "Hiring" option. It is worth noting that normally it is not necessary to pay transfer rate base in young negotiations. When you promote a promise youthful to the first team, the athlete's gratitude is evident in the performances on the field and, therefore, more experience points can be earned per game. Visit the "scout report" in negotiations to check the status of all the promises being watched by the scout. Always try to look at the list of suggested players as the professional contract suggests athletes with little time for positions that still need reinforcements in its cast. If you are looking for a goalkeeper of specific nationality, for example, use the search engine "User's scout" to filter positions, market value of the player, practice area and points to focus on. In the moments before a match, it is possible to study the rival formation as well as evaluating the team spirit data to see if the opponent is mingled. Do not be afraid to change the game plan for a specific match. In the pattern formation, there instruction when the options with or without team has the ball as well as individual tags. Time to climb the players for the duel on the pitch, keep an eye on team spirit. Try to use players who are better physical condition and, of course, more adapted to the cast holder. A good job on and off the field deserves to be recognized. Therefore, evaluate the technical offers received and indicate your preferences to new teams in "technical packages", located in the "Trading" tab. If the results are less than expected and the team is not performing well under your command, you can ask to be transferred. Take over as national team coach is a great showcase for winning the coaching position in the top teams in the world. Don’t hesitate to accept a proposal to train selections (even though less significant), as you continue to be the coach of the club and at the same time, gain visibility in the international market. 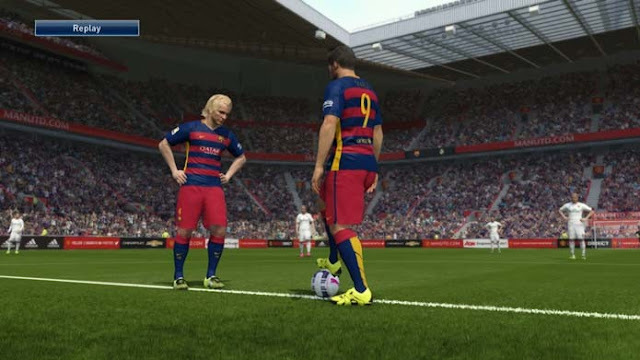 In PES 2016, there are training options to improve certain characteristic of athletes. Want to see your second fastest striker? Suggest a training focused on speed. Aim to improve the physical form of a steering wheel? Adopt exercises focused on the physical part to do so always play at a high performance. The customized training can be done in the "Training Options" indicated in "Team Management" tab in the main menu of the Master League.